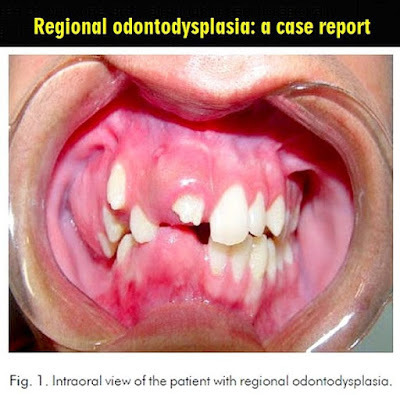 Regional odontodysplasia (RO) is a rare tooth anomaly involving dental tissues of both ectodermal and mesodermal origin, and it usually affects both the primary and permanent dentition. It is more frequent in women than in men, and the maxilla is affected twice as often as the mandible. Generally, it is limited to only one arch, although it can occasionally cross the midline. The etiology of RO is uncertain, although local trauma or infection, teratogenic drug exposure, local circulatory disorders, Rh incompatibility, irradiation, neural damage, hyperpyrexia, metabolic and nutritional disorders and vitamin deficiency have all been discussed as possible contributing factors. RO has also been associated with the activation of latent viruses in the odontogenic epithelium and with the presence of nevi, hemangiomas and hydrocephaly; however, most cases of RO have no associated medical disturbances.